In keeping with the general Holiday theme I want to know a little bit more about you and your Christmas habits! So I am passing along this cute, quick Christmas Meme that I found on Jen’s Humble Opinion 2. So I am tagging EVERYBODY!! (I even copied and pasted this entire intro...not very original of me but Jen copied it, too! Come on and play! It doesn't take long. 1. Wrapping paper or gift bags? Both! 2. Real or artificial Tree? Real. I love the smell. This is our tree before we finished the decorations. 3. When do you put Christmas tree up? I used to put mine up the day after Thanksgiving or the weekend after. But since I got married, and my step-daughter’s b-day is Dec. 8, my husband won’t let us put one up until the 9th, which is what we did the last couple of years. 4. When do you take the tree down? A few days to a week after Christmas. No later than the New Year. 5. Like egg nog? A small mug with a splash of whiskey. (the only time I ever drink whiskey!) It reminds me of my dad. 6. 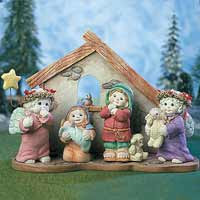 Do you have a nativity scene? Yes, a Dreamsicle one. 7. Favorite gift received as a child? A TV (showing my age, I’ll tell you it was black and white). And Baby Alive. 8. Hardest person to buy for? My 18 year old step-daughter who doesn’t like, need, or want anything. 9. Easiest person to buy for? My son. 10. Worst Christmas gift? A vacuum cleaner. And one time when I was a tot, my goofy Papaw thought it would be funny to get an old boot and put coal in it and wrap it up for me. I didn’t take it as a joke. I think I cried. 12. Favorite Christmas movie? The old Claymation Santa Claus is Coming to Town. Or Charlie Brown. White Christmas. It’s a Wonderful Life. Only one? I can’t have just one! 13. Favorite food to eat at Christmas? My mom’s homemade from scratch (from the deboning of the chicken, to the sauce, to the rolled doughy dumplings) chicken and dumplings! 14. Have you ever recycled a Christmas present? PC term would be re-gift. And yes, I’ve done it! 15. Favorite lights? Depends. This year we have multi-colored. Last year we had clear. 16. Favorite Christmas Song? The instrumental version of Sleigh Ride. (Click title for my post)Gosh, I think I’ve just said that in three posts in less than 2 days now. 17. Travel during Christmas or Stay Home? Stay home! I travel, but not for more than an hour to see my family on the other side of town. One year, bm and bk (before marriage and before kids), I went to Orlando. Loved it! 18. Can you name Santa's reindeer? Dasher Dancer Prancer Vixen Comet Cupid Donner Blitzen and Rudolph! 20. Least favorite thing about this time of year? Crowds! 21. Which one person do you really want to see blessed this Christmas and why. My mother. My dad died 3 years ago, and I know things will never be the same for her. She also recently quit smoking, so I would like her to be blessed in that continued effort. Mostly, I wish a blessing on anyone who is alone on Christmas. I have to add Colin and Connor, by step-grandtwins, to this list, born prematurely and still in the hospital. You did great, I loved it! mmm...chicken and dumplings...yum yum! I loved reading your answers. Hope the prem twins grow big and strong!